See the Kolibri changelog here to review specific changes in each version of Kolibri. Documentation for previous Kolibri versions are available here. To install Kolibri on a device that will act as a server, check the hardware requirements first, and then follow the procedure for the operating system on your device. Below you will find general recommendations regarding hardware requirements to run Kolibri. To read more detailed information and find out examples of hardware setups that have been implemented by our users, download the full Kolibri Hardware Guide and examples of Hardware Configurations for Kolibri (PDF documents). Hard drive space depends on the size of the content channels you intend to import from Kolibri Studio or a local storage device. If you have a facility with less than 30 computers, a device as simple as a Raspberry Pi is known to work fine as a server. Very old desktops and very low-power computers can be used as client devices to access Kolibri. For instance, some implementations are known to use first-gen Raspberry Pi as desktop computers. It is always a good idea to do a practical test, but when you want to implement Kolibri, usually it’s not necessary to scale your hardware. The main requirement is that your system needs a video card and driver that can play the videos. Not supported: Windows XP cannot be used to install Kolibri server, but could potentially work as a client device if the browsers are as up-to-date as possible. Download the Windows installer for Kolibri version 0.12. Python 3 installer is included, confirm the installation or the upgrade to proceed. Follow the rest of the instructions in the Kolibri installation setup wizard. Once the installation finishes, Kolibri will auto-start and open in the default browser on your computer at http://127.0.0.1:8080. This may take a moment, so please be patient. Proceed with the Initial Setup of your facility. 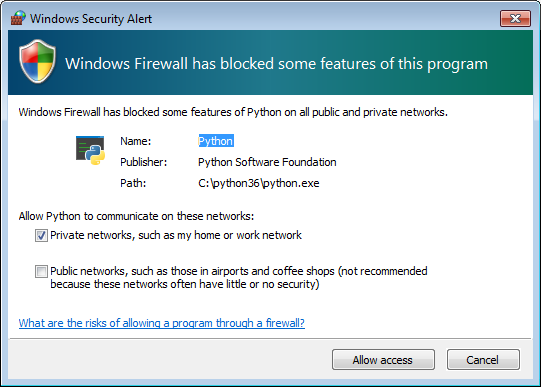 Windows firewall will prompt you to allow the Python process needed to run Kolibri. Click Allow access to accept and proceed. Allow the Python process needed to run Kolibri. Select Kolibri from the list of programs. Click the button Uninstall/Change and follow the instructions. To upgrade Kolibri, follow these steps. Download the new version of Kolibri Windows installer. Follow the instructions in the installation wizard window. Once the installation of the upgrade is finished, Kolibri will auto-start and open in the default browser on your computer. Go explore the new and improved Kolibri features! The advantages of downloading a .deb file is the portability: you can copy the file from device to device and install Kolibri without internet access. Download the latest .deb installer for Kolibri version 0.12, or have it copied to your local drive. If you choose to install Kolibri as a system service, you will not need to start it manually. When the command finishes, open the default browser at http://127.0.0.1:8080 and proceed with the Initial Setup of your facility. Open Software on Ubuntu and locate the Kolibri. Press Remove. Or from the command line: sudo apt-get remove kolibri. When you use the PPA installation method, upgrades to newer versions will be automatic, provided there is internet access available. To upgrade Kolibri on a Debian device without internet access, bring the updated .deb file and follow the same steps as in Install from a .deb file. The system service is the script that runs Kolibri in the background when your system boots on Debian-based distributions. You may need to change the system service to run with the permissions of a different user account. Prior to v0.10, kolibri user account was the owner of the system service, while from v0.10 and later, desktop user’s account is preferred, in order for Kolibri to access the local USB storage. To change the system service owner, you need to change the configuration of the system service: move the .kolibri data folder (containing channels, databases etc. ), and assign owner permissions to the new user. Follow these steps. Replace the $USER in commands above with the name of the user you wish to be the new Kolibri system service owner. There are several varieties of operating systems for Raspberry Pi. This guide is intended for and tested on Raspian, the most popular choice of OS, based on Debian. To obtain and install Raspbian, refer to the official documentation. Read our Raspberry Pi Tutorial for Kolibri. These steps require an internet connection during the installation. After completing the installation, it’s possible to replicate an image for offline installation. When asked questions during the installation, it is recommended that you use the default pi user for running Kolibri because it will have access to USB devices. System time isn’t set properly or resets during power-off. This causes errors while downloading software. For instance, SSL certificates for online sources will fail to validate. Ensure that you have the right timezone in /etc/timezone and that the clock is set properly by running sudo ntpd -gq. Storage space is often scarce. If you have a USB source for additional storage, you can use the kolibri manage movedirectory command or create your own symbolic links to have the data folder located elsewhere. I/O operations are slow: This means that a typical bottleneck on a Raspberry Pi is file transfer to/from MicroSD card or USB attached storage. Once Kolibri is up and running, this will not be a bottleneck, but while copying initial contents of several gigabytes, you will experience this. Both the SD card reader and the USB ports will limit you at 50-80MB/sec. From our experience, it doesn’t matter much whether you are using the main SD card reader for storage or some media connected to your USB, as in principle they both reach about the same maximum speeds. However, you may find significant differences in the speeds of individual SD Cards. When replicating installations, you can save time if you connect the SD card of USB storage to another device with faster transfer speeds. Replication will be described in future guides. From the command line: sudo apt-get remove kolibri. To install Kolibri on Linux distributions other than Debian, as well as on MacOS, you can use generic installation with pip install command, or follow these steps to run Kolibri with the PEX package. Download the PEX installer for Kolibri version 0.12. Type the following commands next (press Enter after each one). Make sure to substitute the kolibri-installer-filename.pex with the exact name of the file you downloaded in both commands. For example, if the name of the downloaded file is kolibri-v0.12.0.pex, type that instead of kolibri-installer-filename.pex. Remember that PEX package allows you to run Kolibri on your system only while the process is active in the Terminal window. If that process is stopped (by either pressing Ctrl + C, closing the Terminal, or restarting your system), you will need to repeat the above steps to start Kolibri again. User accounts, classes and groups you create, as well as the content channels you download, will be available every time you restart Kolibri. Delete the ./kolibri folder in your user’s Home directory if you want to completely remove all the Kolibri files and content channels you imported. Download the new version of Kolibri PEX installer. Start Kolibri as during the first install. 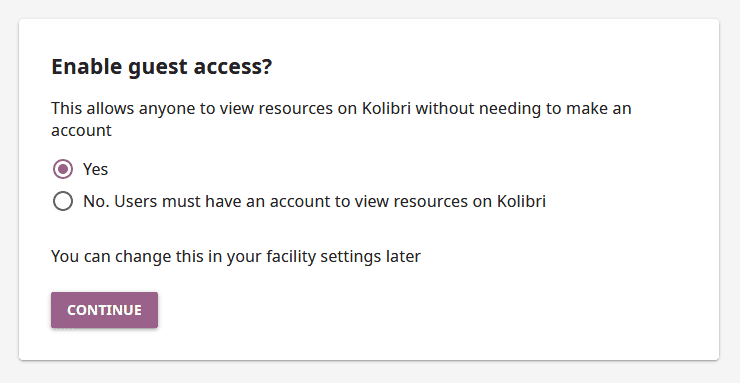 To do the initial setup of your Kolibri facility after the installation, follow these steps. You need to do the initial setup only once, the first time you start Kolibri after the installation. You can change all the settings later, except the type and the name of the facility. Select the default language for Kolibri. Select the default Kolibri language. The default language configured for content in your browser preferences might override the language you choose in this step. To ensure that Kolibri displays in the desired language, make sure to configure it as default in the browsers of all the devices that will be used to view Kolibri content. Facility name and type. A “Facility” is the location where you are installing Kolibri, such as a school, training center, or even your home. Non-formal type can be used in libraries, orphanages, correctional facilities, youth centers, computer labs and similar, Formal one in schools and other formal learning contexts, and Personal should work best for parent-child or supplementary individual learning. Formal and non-formal facilities require a name, while personal ones do not. Choose the type of facility. Select if guests can access Kolibri content without the need to create an account. 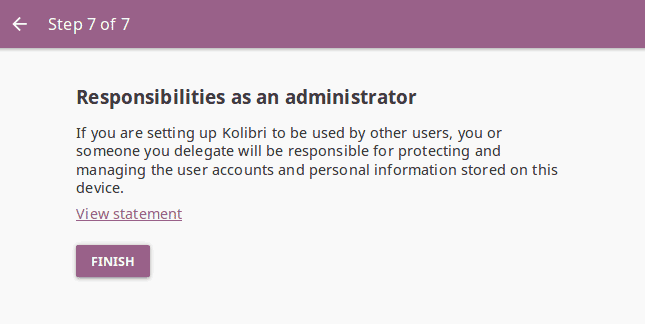 Select if anyone can create a user account for themselves, or if user accounts must be created by Kolibri admins. Enable passwords for learners. Simplified sign-in, without the password requirement, allows easier access for younger learners. Select if learners must type in their passwords to sign-in to Kolibri. Create super admin account. 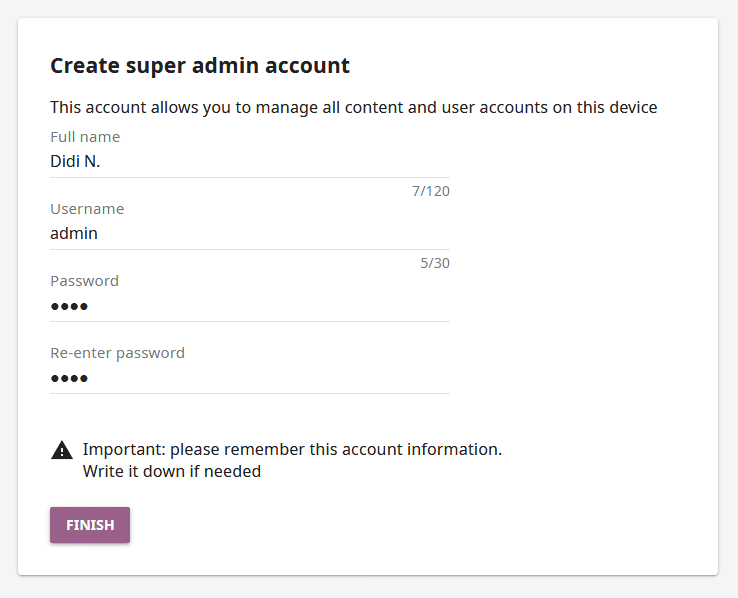 This admin user will be a super admin, able to manage all the device content, and all the rest of the facility users and their permissions. Select the username and password for the facility super admin. Make sure to save these super admin credentials in a safe place! Data usage and privacy - responsibilities of the adminstrator. When you are setting up a Kolibri facility, especially in formal contexts, you need to take into consideration the relevant privacy laws and regulations. You as the super admin, or someone you delegate, will be responsible for protecting and managing the user accounts and personal information stored on the device. Review the data usage and privacy statement before finihsing the facility setup. Review the super admin responsibilities regarding the data usage and privacy. Once you finish the initial setup, proceed to import some content, and create users (if you chose the Admin-managed facility setup). Make sure to check how to configure other computers in the network to access Kolibri.